It’s a surprisingly common problem; you left your teen years behind years ago, but nobody told that to your oily, imperfection-prone skin. Your skin is subject to a barrage of products, environmental aggressors and internal hormonal factors daily that can really play havoc with the balance of your sebum production, and pose problems to the effectiveness of your cleansing routine. Help is at hand though. Every day this week we’ll be taking a look at the most common problems for blemished and oily skin, kicking off with the arch nemesis of a beautiful complexion: spots. Squeezing them generates an inflammatory reaction, and that can only mean one thing: lots of redness and lots of pain! Once the seal of the spot has been broken, bacteria can be spread to other parts of the face and induce more blemishes – it’s a vicious circle! Squeezing out blackheads with the fingers is a messy business. Not only does it really hurt, but it can also lead to the harbouring of infection. Excessive squeezing can also lead to the formation of scars, which can be a pretty harrowing thing when they’re on the face. 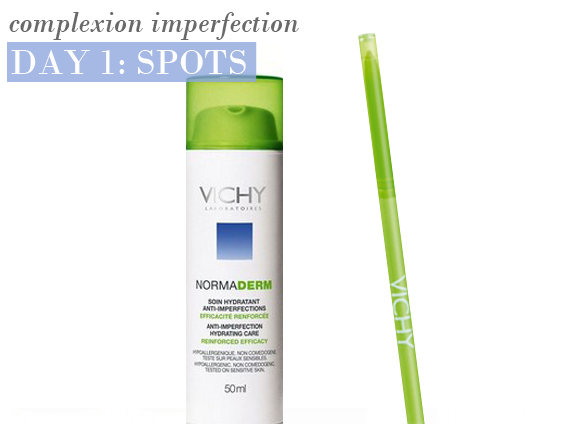 To get rid of blackheads, it is better to use an appropriate skin care product such as the Vichy Normaderm Anti-Imperfection Stick, £6.50, a purifying, localised treatment to reduce inflammation and spot size. If the problem persists, don’t be afraid to consult a dermatologist. When used pure, alcohol dries out the skin without really treating the blemishes. Pure alcohol has no effect on over-active sebum production or on pores. Moreover, its use may redden and roughen the skin and even cause it to peel. Despite this, there are no limits to using products with a small percentage of alcohol, such as the Vichy Normaderm Anti-Imperfection Concentrate, £10.00. Alcohol has a local antibacterial effect, provides a sensation of freshness when the product is applied and helps to preserve the formulation. In a balancing formulation such as the Anti-Imperfection Concentrate, alcohol is a crucial component of the blend, working to greatly reduce inflammation and the volume of eruptions. This entry was posted on Monday, October 25th, 2010 at 4:50 pm and is filed under Hints & Tips, Skincare. You can follow any responses to this entry through the RSS 2.0 feed. You can skip to the end and leave a response. Pinging is currently not allowed.